When this album was released in 1984 the song Rock You was a pretty popular tune here in Sweden. I can’t say that it was a big radio hit in that sense. 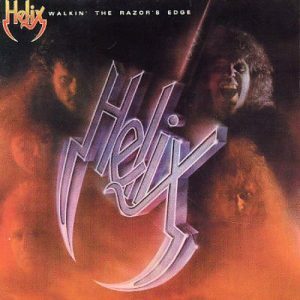 Partly because I don’t remember and partly because I know that Swedish radio wasn’t fond of playing songs from metal albums as Walkin’ the Razors Edge at the time. I think that has changed somewhat over the years but I don’t know to what extent. Anyway, I bought the single Rock You and I bought the album Walkin’ the Razors Edge pretty much when it came out. I can’t really say why I wanted both the single and the album. But I was 14 at the time so who can tell what was going on in my mind. I don’t think I ever listened much to the album and I can’t remember why. When I listen to it now it’s an album that has aged with grace to be sure. Sure, the sound is like in the eighties but that doesn’t mean it can’t be good at the same time. I’ve listed to it for a couple of weeks now, over and over again and I must conclude that this is an album that could define the decade in a good way. I love the songs and I love the production. Maybe that was the problem originally? Back then it was one of many having this kind of production but now it stands out as one of the ones that actually survived the eighties and still sounds good! I think this is an excellent introduction to Helix and I would highly recommend it as it’s both energetic and catchy and with great melodies and riffs as well.